Relaxshacks.com: A tiny mosaic-dome guest house shaped like a woman in a dress!? 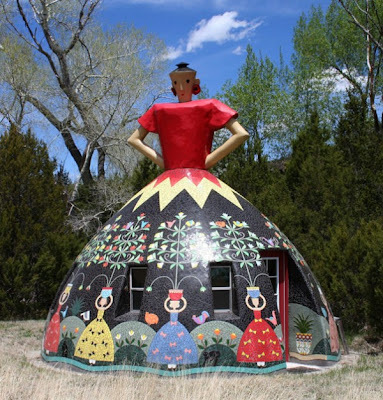 A tiny mosaic-dome guest house shaped like a woman in a dress!? I saw this a ways back on Michael Janzen's site, and just had to share- talk about a WILD guest house! Just when you think you’ve seen it all, there’s always something better. Here’s a unique house that will probably never be duplicated – but possibly emulated. This 18-foot tall dome home was built by artist Bev Magennis. It’s located in remote Apache Creek, New Mexico and serves as a tiny guest space on a larger 10-arce homestead. The entire exterior is covered with mosaic ceramic tile – Bev’s medium of choice for many years. The form is similar to another sculpture series she calls her Garden Ladies. Tiling large mosaics from broken scrap tile is incredibly slow going and tedious. Having spent some time outside in the sun laying tiny tiles I know this house must have taken hundreds of hours and thousands of tiles to complete. But Bev has the patience of a saint and prey drive like no one I know, so for her I’m sure it was just a lot of fun – and something she had to do. The structure of the tiny house is as unique as the design itself. A circular 12-foot diameter concrete footing was poured with rebar-reinforced PVC pipe inserted vertically every three feet. The pipe was then gathered together at the top to form the basic dome shape. Then the dome was lathed and plastered on the inside and out before the tile was applied. I’m pretty sure most of the experienced builders reading the description of how this house was built just cringed. It’s an incredibly unconventional approach, but it sure seems to have worked. Knowing Bev, a true rebel and experimenter, I doubt if she asked for permission to built it or had an engineer review the design. But I also suspect it’s perfectly safe. I remember asking her 20 years ago if she had to get any special permits to tile her big house in Albuquerque (see photo below) or to store a field of tile scraps in her backyard – she just smiled a mischievous smile and said… no (innocently). There were volumes of lessons in that grin and single word answer.